The single most important factor regarding historical documenting is data accuracy. This compilation will present the most accurate datum from a scientific approach, to the best of my human abilities. Enough data, in the form of hard evidence (actual relics), can paint an entire picture of a lifestyle of an era. All items were recovered in Jan, Feb, March, April of 2009 and March of 2010. Only one metal detector was utilized; a Fisher F75 Manufactured in the spring of 2007. Fort #1 appears to have been habitated for approximately 12 months from a period of mid-December 1849 to early December 1850...with as many as 230 men at one point in time within its occupancy. There were two primary wooden structures with a highly definitive outline-perimeter of approx 22 feet by 38 feet. It appears these structures were constructed primarily of wooden plank and, to a much lesser extent, log-cabin style...and not of tongue-n-groove construction... or a very mild version thereof. A large amount of flat boards were utilized. These structures did not burn in any fire. It appears the wood from the structures were removed; subsequently, utilized at a different location for another purpose. Cut square nails are in extreme abundance at all sites. One of the structures was approx 60-feet from centerline to the North of Hwy 98/Broadway. One 'commons' fire-pit has been located. Two other confirmed building sites have been located... one appears to be some form of a cheap/inexpensive motel...or a single family home with a fair amount of visitors. This building location is approx 150 feet further to the North of the main building and approx 100 feet further to the East... right at the edge/beginning of the slope on the West side of the Peace river. More recovery/investigation is required for definitive analysis/resolution. Zero human activity has taken place on this Fort #1 property for (approx) the past 140 years. Possibly (at most) a low maintenance, minimal activity orange grove may have existed...and for a short duration time-span. The golf course had some interesting (verified & validated) activity(s). Portions will be explained later in this report. A blacksmith and/or horse stable were located approx 50-feet from centerline of current day Hwy 98/Broadway (to the South). It appears the bulk of the activity did not exceed a distance of 80-feet beyond centerline of Hwy 98. The bulk of the activity is at the very North portion of the golf course----right up against Hwy 98. Further activity may have taken place deeper into the golf course... but the data has been skewed due to the dirt being disturbed by heavy equipment (probably due in part to the golf course being created...or hurricane foilage). Fort #2 appears to have the bulk of its primary activity taking place from late December 1850 to approx mid-year 1854. Then, on-and-off activity all the way through mid/late-year 1864. Some structures were burned; however, not all... as evidenced by patches of square nails that are charred and other patches never having been exposed to any form of fire/heat. The bulk of the enlisted were on the North side of the current 3rd St. ... in the South and South East quadrant of Heritage park and also appears to continue exterior of the park to the South East by approximately 100-yards. The furthest-most portion of the South East quadrant of Heritage park were two very distinct target-practice training stands. These two 4 feet by 4 feet training stands were separated by 7-feet from each other...with the East stand designated/utilized for rifle and shotgun. The West stand was delineated as pistol only. The shooting direction was NNE (North-North East). A very high volume of fired percussion caps were located around both stands. 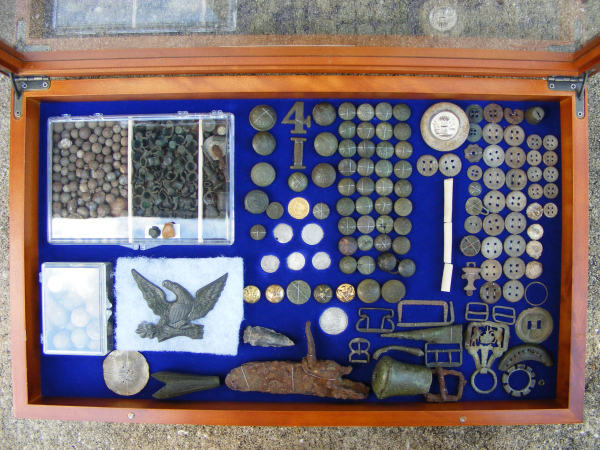 Several unfired .36-cal pistol musket balls and fired percussion caps were located directly around the West training stand. This is to say: no .54-cal & .69-cal rifle musket balls were found around the pistol stand. 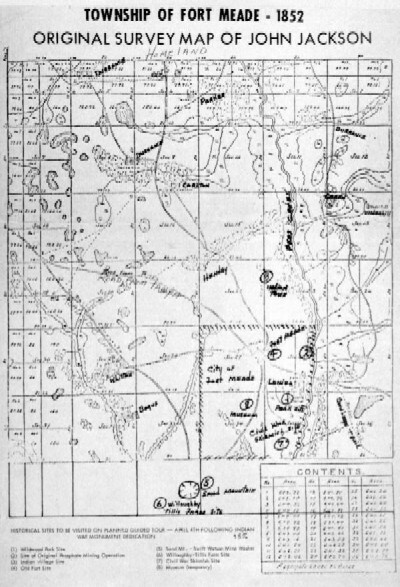 Directly around the East (Rifle and Shotgun only) training stand, many unfired .69-cal, .54-cal, buck-and-ball and buckshot were located...along with numerous fired percussion caps. 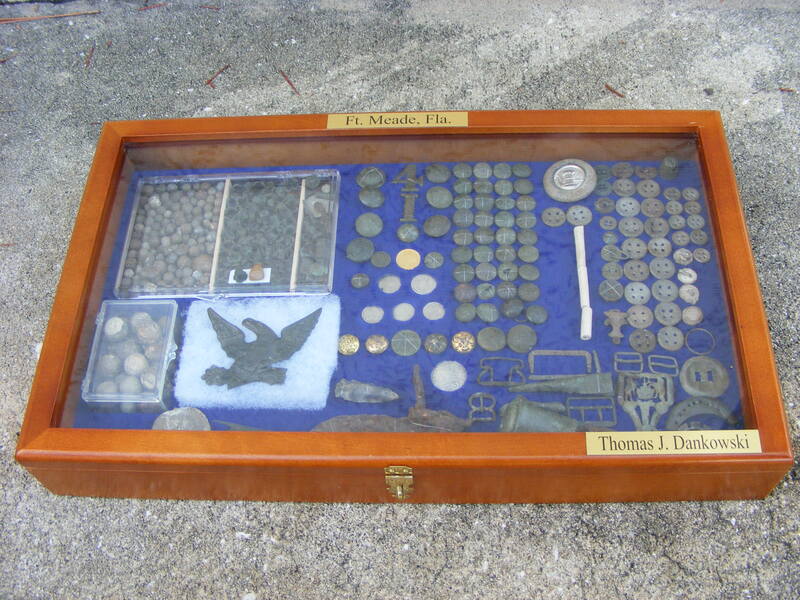 Noteworthy again, this is to say; no .36-cal pistol musket balls were located around the rifle & shotgun stand. Directly behind both training stands (this would be to the South), several unfired percussion caps were located/recovered. This is where the instructors/trainers would stand. Both of these shooting stands were up against the current-day wooden fence of Heritage park, on the inboard side of the park. The trainers were just outside (to the South) of the current-day fence, outboard of the park. The center of the rifle and shotgun stand is located 8-feet to the West of the Eastern-most border fence of the current-day park. The South side of 3rd St. directly across from Heritage park, is verified/confirmed where the officers housed. This would be the North and North West front lawn of a house... up close to...and underneath 3rd St. There may be a cannon buried on a private property front lawn...as one large elongated 'iron item' was detected (and quite deep...nearly one meter), but not recovered due to size... and a large hole (on private property) would be required for recovery. It appears some form of a horse stable was on the very North side of Heritage park... and actually further North on private property. Insufficient data (thus far) to verify/validate. Directly West of Heritage park (on private property) has been confirmed that no form of a structure/fort/building existed that far West; yet, is confirmed to have had military foot-travel on that specific property. It appears neither Fort #1 or Fort #2 were 'fenced' by any form of pine-log posts or any other apparatus. No security fencing of any form to 'fortify' was utilized for any portion of the Fort. There are many other areas that have not been investigated, searched and researched. 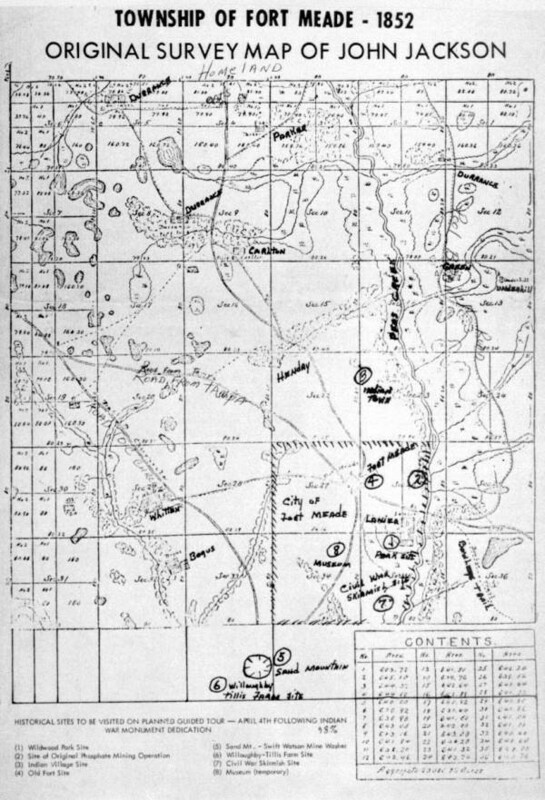 This report is exclusively limited to Fort #1 and #2 and the golf course. The display case is a magnificent aggregate collection of items of "the era"... the period of U.S. Army vs. Third Seminole Indian war. "Magnificent" in the fact that the acidic content of the soil is minimal; virtually non-existent; subsequently, the items recovered are in a superior state-of-preservation. All of the relics are in the top 1 percent preservation status as compared to the rest of the United States. Worthy of mentioning, this dirt is so inert, it is nearly inorganic. Hardly any trace-elements of folic or tannic acid, minimal trace elements of lime, no salt content. It is very rare to find this order-of-magnitude preservation state. 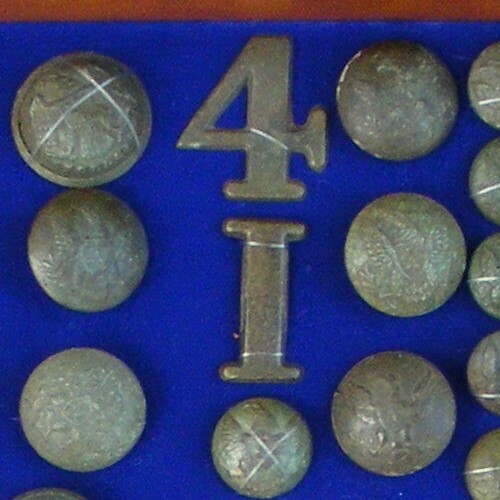 Top Center - A large number "4" and a large letter "I". Forth Artillery and Infantry; respectively. Both were found at Ft. #2 directly behind the two shooting stands. There is a strong possibility these two insignia devices belong to Maj. Thomas J. Jackson (Stonewall Jackson). Currently, there is insufficient data to validate this claim. Directly underneath the letter "I" is a U.S. Army button with a "I" in the center of the eagles breast. Ironically, this is the only "I" Infantry button ever found at this site. All of the other buttons are Artillery "A" buttons...or general service buttons. 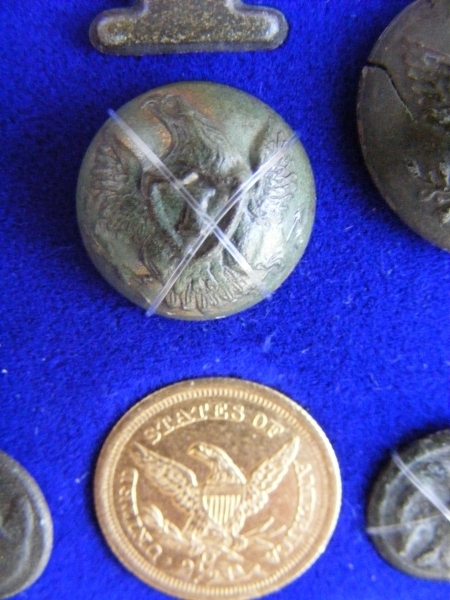 Directly underneath the letter "I" is a U.S. Army button with a "I" in the center of the eagles breast. Ironically, this is the only 'I' Infantry button found at this site. All of the other buttons are Artillery "A" buttons......or general service buttons. 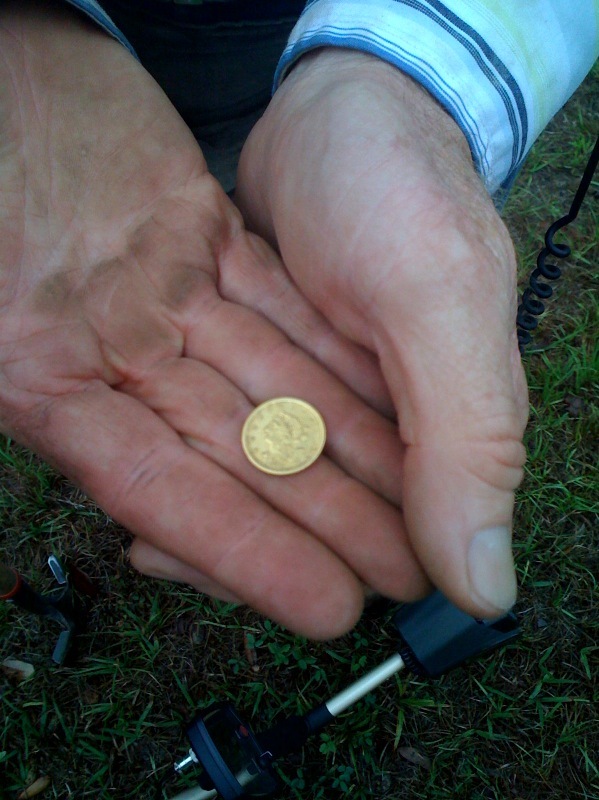 Directly underneath the Infantry button is the highlight of any detectorists career; a United States gold coin. (((This is the only gold coin I have ever found in my entire life...and certainly is the pinnacle of my detecting career, thus far))). It is a U.S. 2-1/2 dollar "Quarter Eagle", 1843, small-date variety, crosslet '4', 'O' mintmark (New Orleans), die-break mint error. It was lost approx Dec 17, 1849. This scientific determination comes from: date of coin, current condition/wear of the coin vs. rate-of-wear models, buried depth of the coin, location found, soil type, soil strata, soil sink-rate data, of whom were issued this type of coin and a few other various indices. With near certainty, it belongs to Lt. George G. Meade (97% probability), Lt. Henry Bainbridge (2%) or 'other' (1%). This coin was given in specie payment to a military officer as a 'weekly paycheck'. It was found on the very Northern part of the golf course..... approx 60-feet South of Hwy 98 centerline. It was most probably lost at night... and possibly off of a horse. 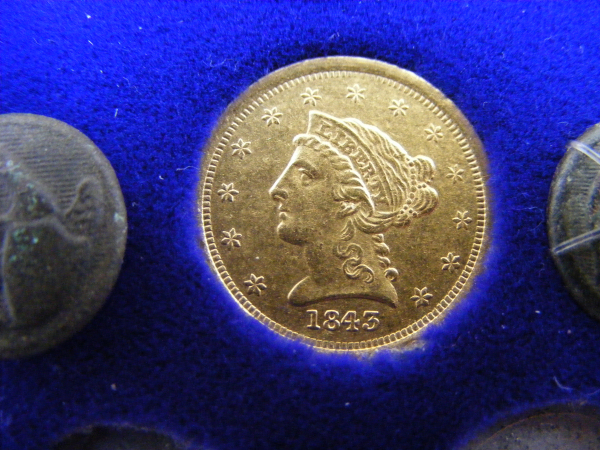 Gold coins were officers paychecks and silver coins were enlisted men paychecks (usually Half Dimes... prior to Civil War). 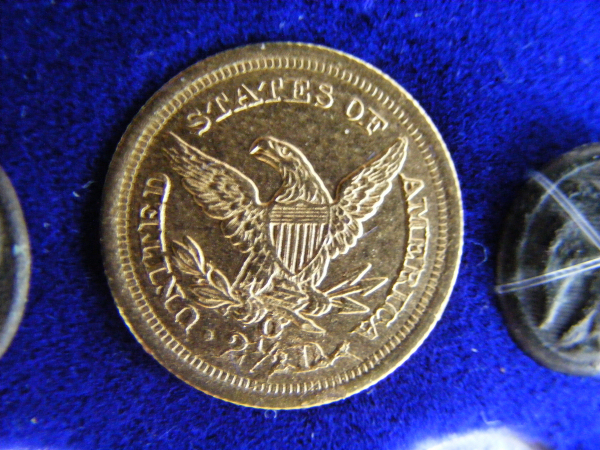 Back side of the U.S. 2-1/2 dollar "Quarter Eagle", notice the 'O' mintmark. This photo was taken shortly after finding this wonderful gold coin.